The lack of electrification in parts of the world leaves many healthcare facilities with inadequate power provision for even basic services. It is estimated that nearly 38 million people in India are dependent on Primary Health Centres (PHCs) without electricity supply. Pilot projects show that solar power has the potential to reliably electrify PHCs, bypassing unreliable centralised grids. 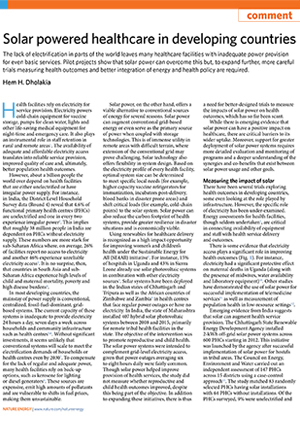 Following up on our independent evaluation of 147 PHCs across 15 districts in Chhattisgarh, this journal paper, published in Nature, reiterates the immense opportunity for solar energy to bridge the gaps in electricity access in rural healthcare facilities across the developing world. PHCs with solar power conducted 50 per cent higher institutional deliveries and provided round round-the-clock services. 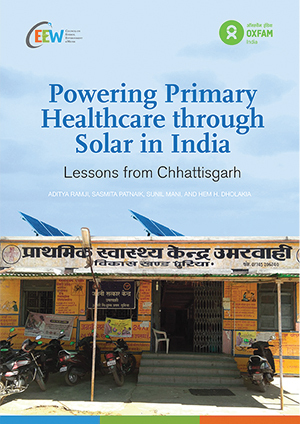 Nearly 70 per cent of health centres with solar power provided emergency medical services 24 hours a day, seven days a week as compared to 48 per cent without solar. Solar-powered PHCs reported a 59 per cent increase in outpatient services, 78 per cent increase in deliveries and 45 per cent improvements in laboratory services after installation. Energy is a critical enabler in achieving several other sustainable development goals (SDGs). Research reveals that 113 SDG targets require actions pertaining to energy systems. 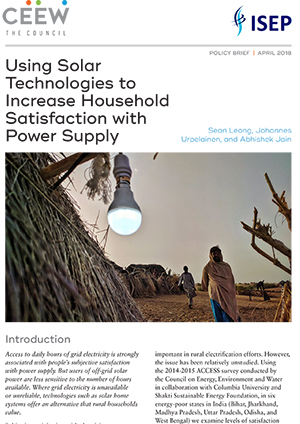 There is evidence that access to clean energy (SDG 7) can positively reinforce attainment of health and well-being (SDG 3), sustainable cities and communities (SDG 11) and responsible consumption and production (SDG 13). More and better designed trials are required to build the necessary policy and financial support for scaling solar for healthcare. More holistic policy thinking across ministries and departments is needed to recognise funding opportunities with multiple benefits.